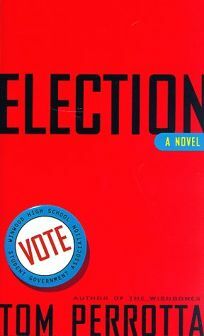 A far cry from Sweet Valley High, this wry, engaging story of a 1992 high-school election in a New Jersey town ""a couple of exits"" away from Glen Ridge is observant and sly, if less amusing than the battles over pop-musical taste in Perrotta's quirkily humorous first novel, The Wishbones. The candidates for school presidency of Winwood High are an uninspiring bunch campaigning for what almost everybody knows is an empty office. Ambitious Tracy Flick is a hot bundle of raw political ambition and a bad reputation, who campaigns with cupcakes against Paul Warren, a jock with a pretty face and high PSAT scores who is urged to run by his history teacher (and sometime narrator) Jim McAllister. Paul's nihilistic sister Tammy (who enters the race in a despairing rage because she's in love with Paul's girlfriend) is the single fresh and original character here--and she gets herself suspended before Election Day. The results are blessedly far from feel-good, and Perrotta casts a wonderfully cool eye on his ostensible protagonist, ""Mr. M.,"" even if the hints of true political satire remain just that, tantalizing hints. Despite six alternating narrators, this is a simple, spare story--designed, perhaps, with moviegoers in mind as well as readers. (Mar.) FYI: A movie version already is in production with MTV Films/Paramount, featuring Matthew Broderick as McAllister.